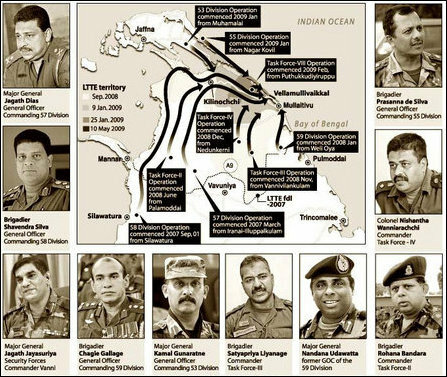 Suspect Sri Lankan war criminal, Major General Chagi Gallage, a member of Mahinda Rajapaksa's entourage to London, escaped arrest by his premature departure from Britain, British daily Guardian reported. "An application [for arrest warrant] was lodged at Horseferry Road magistrates court, central London, but inquiries by Scotland Yard established that he [Chagi Gallage] had left on Thursday night," the paper said. Tamil campaigners sought the arrest warrant claiming that the ex-General who was in-charge of 53 & 59 divisions committed war-crimes by intentionally shelling civilian hospitals while advancing towards Mullaiththeevu area. "Gallage held command responsibility jointly or severally and therefore should have known that his subordinates were about to carry out the attack or had done so, and he did not take the necessary or reasonable steps to prevent the crimes or to punish the perpetrators," the warrant application alleged. Tamil activists claimed that the attacks on hospitals is a violation of section 51 of the International Criminal Court Act (ICCA) which is an implementing regulation "to give effect to the Statute of the International Criminal Court; to provide for offences under the law of England and Wales and Northern Ireland corresponding to offences within the jurisdiction of that Court; and for connected purposes by virtue of section 70 of Coroners & Justice Act of 2009." Specifically the attacks on hospitals are a violation of Article 8(2)(e)(ii) of the ICC's Rome Statute, namely “intentionally directing attacks against buildings, material, medical units and transport, and personnel using the distinctive emblems of the Geneva Conventions in conformity with international law," the complaint asserted. While Sri Lanka has not ratified Rome Treaty, the UK's local implementation regulation provides jurisdiciton to UK courts to prosecute violators regardless of whether Sri lanka is a party to Rome treaty or not, legal sources said. Tamil activists also handed a collection of evidence and reports from international human rights organizations including International Crisis Group, Human Rights Watch, and Amnesty International, and the US State Department Report together with the warrant application. (b)a warrant to arrest that person and bring him before a magistrates' court. (6)Where the offence charged is an indictable offence, a warrant under this section may be issued at any time notwithstanding that a summons has previously been issued. (7) A justice of the peace may issue a summons or warrant under this section upon an information being laid before him notwithstanding any enactment requiring the information to be laid before two or more justices. Jan Jananayagam, the British-representative of US-based activist group, Tamils Against Genocide (TAG), said, "while we are disappointed in allowing the suspect criminal to escape, the legal activists will learn from this experience and will be better prepared next time a suspect Sri Lankan war criminal enters Britain." 03.12.10 War crime suspect in Rajapaksa entourage plans cha..